Prior to the implementation of Trump-o-Nomics, 2018 Edition, most people with a smattering of historical knowledge and economic literacy knew that tariffs were a Bad Thing. The Smoot-Hawley Tariff Act of 1930 was a stupendously wrongheaded action, one that combined with and exacerbated other errors and spawned the the Great Depression. Trade protectionists are typically driven by political considerations (e.g. unions and other constituencies that benefited, no matter the (greater) cost to the nation as a whole) rather than sound economics, and the Right, in particular, has generally claimed to support free trade (in practice? See the last parenthetical). And, indeed, many on the Right continue to assert free trade as sound economic policy (the Left is too busy coveting other people’s money to advance a coherent trade policy, other than “if Trump does it, it’s wrong), even as Trump stacks tariff upon tariff, clobbering the stock market, inducing layoffs, and prompting assistance and bailouts for a select few affected sectors. Many of these free-traders insist that Trump’s tariff mania is purely tactical, that he’s actually a free-trader who’s using tariffs to break open China’s markets and force needed reforms against intellectual property theft. They even have some Trump quotes to support that position. Unfortunately, there’s a Trump quote that can support almost any position one chooses. The Untethered Orange Id has shown no propensity for measuring his words, for being honest and careful in what he says, or for exhibiting any sort of ideological consistency. His track record of actions supports the conclusion that he’s flying by the seat of his pants rather than working towards a predetermined goal, but that doesn’t stop his defenders from presuming that he’s secretly what they want him to be, all contrary pronouncements and actions notwithstanding. This attitude parallels that exhibited by Hillary Clinton supporters over the years and decades. Many was the time I recall Clinton’s defenders excusing an illiberal position or statement with some dissemblance that was, in essence “we know what she actually believes, she just has to tell some tactical lies to get elected and get things done.” Unfortunately, mind-reading is pure hokum, so this adds up to little more than wishful thinking. Politicians lie (insert gratuitous cliche about lips moving), and they keep doing so because we tolerate and excuse those lies. I expected that the apologists’ defense in response to his tweet on the morning of December 4th would emerge thus, and I was right. Meanwhile, the stock market promptly tanked, reversing the gains it had made the previous couple days after signals arose that some resolution might be forthcoming. All those “I’m a free trader” quotes include caveats and “buts,” which make me question his commitment (and indeed, even his definition). 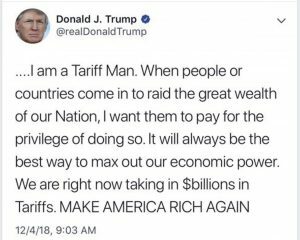 His proclamations favoring free trade don’t exactly rise to the certitude or boastfulness of “Tariff Man!,” and anyone trying to scry some truth from all the mixed messages would not be out of bounds to conclude he likes tariffs and trade wars more than actual free trade. Indeed, reading his statements on free trade actually support the idea that he sees trade as a competition to be won or lost, rather than something of mutual benefit. He’s also voiced much concern about trade deficits, which further supports the last conclusion and illustrates his ignorance on the subject. Yet, I know, even as I write this, that some Trump-supporting free traders will continue to assert that 1 – all this is purely tactical, 2 – that Trump is indeed a free-trader in his heart, and 3 – that this’ll all work out in the end. As to the first point? Tendentious and counterfactual speculation, a reading of the tea leaves that is refuted by an Occam’s-Razor ‘simplest’ conclusion. The preponderance of evidence speaks to the contrary. As to the second point? See above re mind-reading, but consider also that many successful businessmen are not capitalists and free-traders, that they’ve no problem with using government meddling and force to drive advantage their way. Trump’s given us plenty of reason to believe he’s got a win-lose/zero-sum attitude towards economics, which can work for a competitor in a market, but is deeply wrong-headed for a steward of the American economy. A trade deal is not a business deal, but he’s shown little to suggest he understands the difference. So, color me skeptical again. As to the third point? I’m no Nostradamus, and Trump has shown instincts that warn anyone who would count him out not to do so. It may indeed work out. Trump may indeed flush his Tariff Man! persona down the swirly, reverse the tariffs he’s imposed, and ink a free trade agreement. And, the damage being done by his trade war may yet get remediated. Or, it may not. As I wrote recently, it’s a very risky strategy, and there are many ways in which it can go wrong or do harm. And, if Trump’s speaking his real truth in the aforementioned tweet, we’re likely to feel a lot of hurt for quite a while. All that remains to be seen. In the meantime, if you’re still embracing the ‘secret free-trader’ narrative, please, just stop. It’s OK to criticize him from time to time, even if you are a broad supporter. No one’s going to take away your MAGA hat if you do. I suspect that even he doesn’t know what his end-game is, that he’s making it up as he goes along, and that no one can safely say what he really wants out of all this. But, if I were a betting man, I’d put my money on Tariff Man! over Free Trade Man!.